"Ghetto walls are strangling Bethlehem. But this hard, vivid, and personal film shows its spirit and message can still touch the heart and renew the promise of a struggle that will not be defeated. Highly recommended for college courses focused on Arab-Israeli relations, religious freedom, or comparative ethnopolitical conflict." "Open Bethlehem is a fierce and poignant plea against the incarceration of a city...[The filmmaker's] Open Bethlehem project is the kind of first step on which peace processes are built. It deserves to succeed. " "This inspiring film fills a gap in the literature of occupation and in the literature on women and peace-making within the context of Palestine and globally...Leila Sansour's journey is at once deeply personal and political, successfully educating and motivating us with its stunning moment-to-moment tale of creativity, vision, despair, hope, and ultimately inimitable determination of the human spirit...This film will recreate its own vision of healing with each showing." 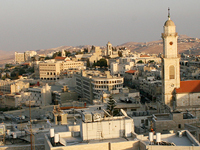 "This film shows the struggle of those living in the city of Bethlehem...Chronicling the efforts of a small group to forge international partnerships and solidarity with the city to help keep it alive, the documentary intersperses historical narrative of Bethlehem's history with the story of the group's travails. Open Bethlehem is an excellent complement to courses in Middle East politics, grassroots organizing, or citizen diplomacy by showing what a small group of committed individuals can accomplish in the face of tremendous odds." "Open Bethlehem offers unique insight into the lives and experiences of the people living in Bethlehem over the past turbulent decade...The film offers people a deeper understanding of the challenges faced by this multi-faith community whose struggles have an enormous influence on the cause of peace today." "Open Bethlehem is a non-violent attempt to save a city that belongs to many in the world. It is unconscionable that Bethlehem should be allowed to die slowly from strangulation." "Open Bethlehem gives a realistic picture of aspects of Palestinian life under Occupation in the special circumstances of Bethlehem. This film would be useful for classes or groups with little previous knowledge of the Palestinian plight." "I strongly recommend this film. It will not just inform you about the tragedies of Bethlehem but will inspire you, by the courage of Leila and her friends, to believe in yourself and your voice and become part of this movement." "Transcends politics and normal cinema." "As an Israeli Jew and a historian of the Arab-Israeli conflict, I warmly recommend this documentary to anyone interested in the Palestine question. I was moved to tears by this beautiful film."